← Let’s continue that last blog post conversation, shall we? Gosh: who knew taxes were the third rail of garden blogging? What social scab shall I pick next: Capital punishment? Religion, maybe? In all seriousness, these last two posts have been fun? something for me to think about, and I enjoyed your responses to them. All I am really trying to say in both is “do what you can, can what you do,” and hopefully others can benefit from your home-grown goodness too. So many of our problems are beyond our control. Our weeds (mostly) and our own small steps toward self-sufficiency and teaching and wide-eyed learning are definitely in our control. So, in the Hebrew then, amen: meaning, so be it. Do what you can. And it is with wide-eyed wonderment that my old eyes see things when I go through the gardens or henyard accompanied by a small-ish child. Even without such a companion, the garden world is plenty inspiring. Add a goat in milk and the process of changing that milk into food and I am agog, and pleased. Pleased, and worried, as there is so much! This brand-new month of August hangs heavy with the fecundity of the farm: the babies, the leaves, the weeds, some bugs and all that food!! Do you have enough time to deal with it all and still sleep at night? There’s wide-eyed, and there’s wild eyed. 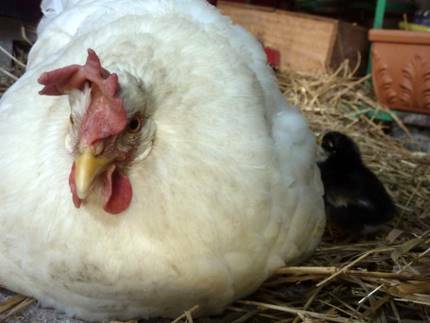 Unbelievably, our flightiest chicken, Pauline, is now a mom. Her chick brings the chick total to 38 for the year. Granted, it’s new for us, Tomato Season. It’s only Sunday that there were enough tomatoes to harvest for dinner. Most of gardening and farm-type living is doing this exact thing: treading water until the deluge. 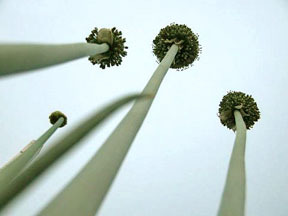 The weeds can be attended to now, but soon, they can wait. And then, all that canning. And then, it ends. Amen. And let us feast. The first tomato dish is probably also the easiest: dump hot pasta atop finely chopped garlic, onions, tomatoes and torn basil. Add olive oil and salt and pepper, splash of Balsamic, then mangia. I seem to still be treading water, but only for another day or so I suspect. The tomato canning may start any day now. I put in a dozen transplants of mini cabbages this morning, knowing the time is short to get it done. I’ll try to sneak in the other dozen this evening or tomorrow morning. And we don’t even have babies or milk to deal with! I LOVE the first picture of Pauline. It’s iconic. And hilarious. That pasta/tomato dish is also how I welcome the first tomato harvest. And having just moved from Texas to Oregon, it looks like I get to have a second (small) tomato harvest this summer, even if just from a few quickie plants in pots till I get a garden going. No way can I pass up a two tomato crop opportunity! I’ll add my amen to that, El. My garden has looked so pathetic most of the year, but Great Nature heals, and now even my saddest-sack plots are looking abundant. On canning what you can, I second that emotion, also–once I started thinking of preserving in the same frame as cooking, rather than as “Industrial-Scale Food Storage,” I became a much happier camper. canning season for me is a kind of weird pleasure; i really enjoy the crazy bustle of it all. i’ve learned a lot too, about what i should and shouldn’t be canning. here, i am trying to provide upwards of 20% of the food we eat off this land, which is paltry compared to El, but about what i can manage given my work schedule. i’m mostly a ‘serious gardener’ and not yet a real home farmer, altho if i can evolve into that i will. one lesson i’ve learned over the last few years of canning is that i shouldn’t make so much soup. it just doesn’t get eaten as fast as canned goods like tomato paste or chopped tomatoes. this year, i intend to can things mostly by themselves, and just use ingredients mixed together at cooking time. i will say this for my soups (which were always a time saving solution during harvest time, just make a big batch of chopped mixed veggies, whatever is harvested that week) is that they are a terrific gift/barter item. everyone is so curious about what they taste like, in a way that they are not about singleton canned goods. so when i’m ready to take advantage of MI’s new home farm sales laws, i’ll be back to making more soup. OMG that first pic of Pauline is ADORABLE LOL!!! I made that pasta dish last week, the only difference is i put in a spash of lemon, and some hot pepper flakes..it was DELISH! Well, I have tomatoes, but none that are ripe yet. I’m still waiting. In the meantime, I had to pull up one of my 5 plants, blight or wilt, I’m not sure. It only had 4 golf ball sized tomatoes on it, already shrivelling up. If I can find the plants, I may try again later when it’s cooler. It’s just so dern hot down here now, 110°-115° heat indices. On jam, you should try strawberry/jalapeno. Gosh, we got some at the fruit stand here and it was great! But…we like it hot here. DH’s mom in TX made peach/jalapeno. I hope she sends me some. Garlic jam? That sounds interesting. What do you eat it with? Whew, October is nearly here! That’s when our cooler weather starts arriving. I can’t wait. Even my plants are hot. I finally caught up with your last several posts and the replies. Viva Revolution! Wow, look at all your canned jams… Garlic? Wow! Never had that before! The pasta looks scrumptious. Yes! I can just about hear the tomato drumroll! They are definitely getting ready to pounce here. Friday was pickling day here. A friend and I processed 50 qts of dilly beans, a dozen each of pickled cukes and zukes and banana peppers. Sunday the hubby and I processed 5 dozen corn on the cob. 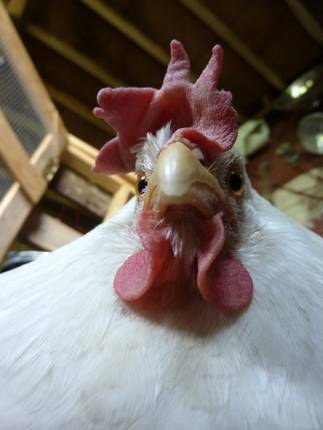 I love the first hen picture! And “Mama Pauline” was the name of my great-grandmother. A good, but tough old lady who lived to be 96. I’m trying canning this year for the first time — the hot summer has created a tomato tsunami! Will you share the roasted garlic jelly recipe? I’ll trade you for a raspberry/red currant one that I’ve been playing with. 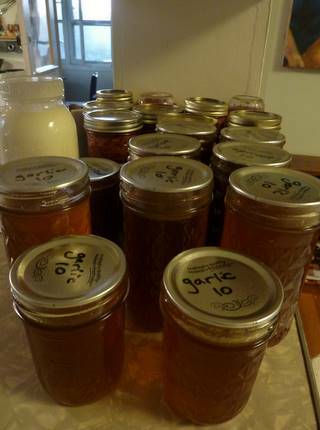 (Mama’s not getting to do a lot of canning right now, but I can’t go a whole year without a little fix). Karen! You weren’t the first to ask, but here you go: I listed the recipe a while ago when I first made it. It’s for a jelly. The leavings (strained-out garlic and spices) are fabulous whizzed up and spread on dough for a tomato-less pizza, among other things. To make it really thick, you will need more pectin than the recipe calls for, but I don’t bother, mainly because I like it in a thick-syrup form. Here you go: the recipe is in the comments. Oh, well, now you know: I wasn’t reading you back in 2008. (Just so you don’t feel too badly, I wasn’t reading any blogs yet in 2008!). So thanks for the link. For the currant/raspberry jamlike thing, I pored through my collection of antique cookbooks. The basic procedure I settled on is, wash currants and add to a big pot. Crush slightly and bring to a boil; simmer 15 minutes. Wash raspberries and add to simmering currants; cook 15 minutes. Put the cooked fruit through the fruit and vegetable strainer apparatus for the Kitchen Aid mixer (my new favorite toy). Measure pulp, add sugar and stir well. Bring to a boil and start checking for the jellying point 5 min after the mixture returns to a boil. On the first batch I used equal amounts of currants and raspberries (2 lbs or 4 baskets of each) and 3/4 cup sugar per cup of cooked puree. It was a little too tart and not quite enough raspberry-y for my taste, so the next time I tried 3 baskets of currants, 5 baskets of rapsberies and 1 cup sugar per cup of cooked puree. Pure heaven. Kate, yeah, the whole anticipation-of-harvest thing reminds me of waiting for a thunderstorm around here: the clouds are darkening, the wind starts, then, blammo. Deep in the thick now, aren’t we? Hah, Kelly, I wouldn’t either! Although, well, unpacking my kitchen boxes might be more tempting…where is that whisk? Chidy, 20% on a city lot is nothing to sneeze at! And yeah I mostly consider myself a serious gardener too and it’s only when I consider the size of my garden that I think, maybe, I might be underselling myself. But soups. My dreaded item downstairs is beet greens. Did I really think I would eat them? But: I do love to can up some beans, like, lots of them! So easy, and yeah, the soup-making thus becomes a lot easier. Happy canning season, I say. CatHerder, the hot pepper flakes do make it! The child, well, she protests, so it’s a DIY thing at the table. 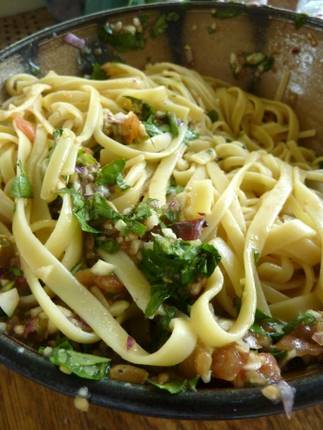 And yeah, that pasta dish is so yum. Jules, yipes, you like the hot stuff more than me. Must be your years living down there…somehow hasn’t quite made it up here! And yeah, in the old greenhouse, things are getting so hot in there I have had lousy fruit-set and one dead tomato plant, unheard-of! But, well, it’s bee hot! Hope your fruit eventually ripens, though. WS: I bow deeply. Sometimes, I like a bit of a brawl. Amanda, pickles! So late here, all my fault, mainly to avoid the dreaded cucumber beetles…planted them late. I wish my family liked pickles as much as I did. But thanks for the reminder about the corn. I do much like you do, in the pressure canner. And, can I say how jealous I am that you get to can with friends and the hub? Just me here, sniff. Jackie, Pauline was my great-grandmother too, but I never knew her. “Tough old bird” was the one descriptive I have heard though used about her. We can only hope to be so…long-lived! Hi Eliza J! What a fun way to spend vacation! Okay, well, that’s the way I am spending MY Vacation, this week…yum. And yeah, tomatoes. If I am feeling particularly time-pressed, I tend to roast them seeded skinned and chopped (or just chopped if I’m in a big-time rush) and set them in a big casserole or two in a 200-250 degree oven overnight…then I get up early and put them through the food mill, put them in a pot and put the pot in the fridge until I am home from work later…and then I heat the pot, and THEN I can them. Sometimes, this saves time, and the tomato sauce isn’t so watery.